Following the Department for Education (DFE) in England’s £2m investment in the future of the successful BFI Film Academy, 66 talented new graduates today premiered their work at a special Graduation ceremony at BFI Southbank to an audience of UK film industry leaders. At the event, special guest Francis Lee, the award-winning writer/director of 2017’s God’s Own Country, shared his experiences of developing a successful career, which saw him attract box office success and critical acclaim for his debut feature. The Film Academy, now in its sixth year, provides 16-19 year olds with a proven entry point to the film industry by offering both technical and artistic skills. 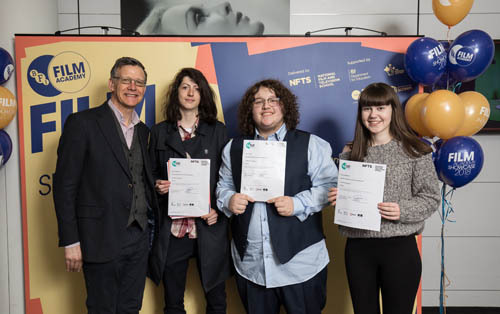 Hosted by Danny Leigh, BFI Senior Curator Fiction TV & Film, Amanda Nevill, CEO of the BFI and Dr Jon Wardle, Director of the National Film and Television School presented the young filmmakers with their graduation certificates. With the BFI Film Academy becoming a trusted and effective route into the industry, the annual graduation is regarded as an opportunity to spot and meet new up and coming talent. Companies attending this year include BBC Films, Lucasfilm, Number 9 Films, Working Title, Pathe, Warp Films, Origin Pictures and Lionsgate. In its sixth year and open to young people from anywhere in the UK, the BFI Film Academy offers a chance for talented 16-19 year olds to develop the specialist filmmaking skills they need to be part of the future of the UK film industry. The BFI Film Academy offers bursaries to help those in need with costs, ensuring it is open to as diverse a range of young people as possible. Based right across the UK the Academy has created more than 5,000 places for young people on courses run across the UK since 2012. Of all alumni, 85% have pursued film education or become employed in the sector, with only 5% reporting not continuing any film related activity since completing the Film Academy. There were three participants from Northern Ireland who took part in the showcase. The three participants were Mercer Macwilliam Hughes, Oisín-Tomás Ó’Raghallaigh, Charlotte Marshall. Nightless – A working-class mother prioritises security over an employment opportunity, putting her relationship with her traumatised daughter at risk. Hindsight – Tony, an ex-convict and addict, desperate for a new relationship with his daughter and former partner, must overcome his past temptations and prove that he’s final changed his ways. Clown in a Church – The determination of an ambitious journalist transforms an amateur documentary about a dissatisfied clown into an essay on the meaning of morality. The Narrator – Finally rebelling against the narrator that controls her life, an ordinary woman desperately tries to break free from her role as the leading lady in a movie she’s tired of starring in. Cabin Fever – In an isolated cabin in North Dakota, a widowed doctor must confront his past after a young man breaks into his home. Bittersweet – In 1952, a struggling Scottish single-mother must choose between financial security and the safety of her son when someone comes knocking at her door.